My husband is the crepe maker in our family and while he's constantly trying new recipes, we really loved this one. In my opinion there's nothing better than a freshly cooked crepe filled with strawberries, whipped cream and cinnamon. Except for maybe if it was filled with strawberries and Nutella. That might be even better. 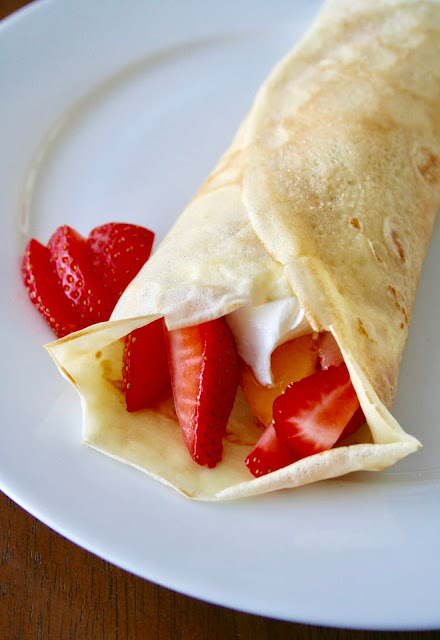 This is the perfect crepes recipe for breakfast, lunch and dinner and I'm sure your family and friends will love them! 1. In a blender, add all of the ingredients. Pulse 10-15 seconds until combined. Let mixture sit for 30 minutes at room temperature. 2. Heat a lightly greased frying pan over medium high heat. Pour 1/4 cup batter into the pan for each crepe. Tilt the pan with a circular motion so the batter coats the surface evenly into a thin layer. 3. Cook the crepe for 1-2 minutes or until the bottom is light brown. Loosen with a spatula, flip and cook the other side. Serve hot with fresh fruit, whipped cream, powdered sugar, etc.